Saudi Arabia's campaign against corruption is hurting companies and markets beyond its borders. Some of the biggest names in Dubai real estate saw their shares slump this week as regional markets were hit by fallout from the Saudi anti-corruption purge at the weekend. The sell-off was triggered by concerns about the exposure of companies in Dubai to Saudi business, the risk of Saudis pulling their money out of the United Arab Emirates, and broader fears about regional stability. In a surprise move on Saturday, at least 49 Saudi princes, businessmen and officials were rounded up and accused of corruption. The list includes Prince Alwaleed bin Talal, the billionaire businessman who owns a global network of major investments. He has been charged with money laundering, bribery and extortion, a Saudi official told CNN. His company, Kingdom Holding, has not responded to requests for comment. "The market is driven by the recent geopolitical tension in the region and that's causing investors to panic," said Tariq Qaqish, managing director of asset management at Menacorp in Dubai. "We expect the market to continue to be volatile due to the uncertainty." The Dubai stock market -- the most active the Gulf region after Saudi Arabia -- posted losses for four straight days following news of the purge. It ended the week down 5%. Emaar, the developer behind the Burj Khalifa -- the world's tallest tower -- saw its shares fall 6% this week. And Damac, which built a Trump branded golf course in Dubai, plunged 8%. Both developers are heavily exposed to the fortunes of Dubai's real estate market, and also have several projects in Saudi Arabia. 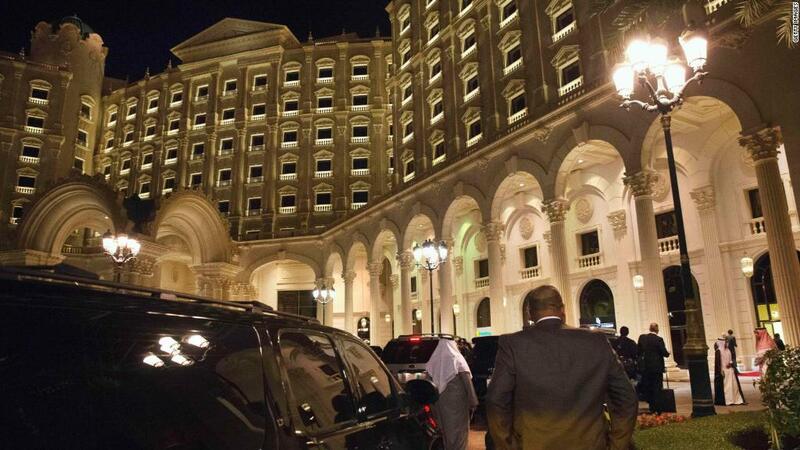 Related: Riyadh's Ritz-Carlton: Luxury hotel or detention center for Saudi royals? There are deep political and commercial ties between Saudi Arabia and the United Arab Emirates: more than a million Saudis visit Dubai every year. They're also close allies, leading a boycott against neighboring Qatar, accusing it of funding terrorism (a charge Qatar denies), and fighting Houthi rebels in Yemen. The potential for the UAE to be drawn even deeper into the Saudi turmoil was underscored by reports that it had asked banks for information on the accounts of 19 Saudi royals and officials. According to a central bank notice widely shared on social media, UAE authorities want banks to "immediately" search and report on activity on any financial instrument held in the UAE by Alwaleed and others. CNN could not independently verify the document. The central bank did not respond to a request for comment. Saudi Arabia said Thursday that corruption had cost the kingdom $100 billion over decades. Also unnerving investors in the region is the prospect of an escalation in the proxy war between Saudi Arabia and Iran in Yemen. Iran-backed Houthi rebels targeted an airport in Saudi Arabia's capital with a ballistic missile earlier this week. Saudi officials said the missile was intercepted. In comments reported by the state-run Saudi Press Agency, Crown Prince Mohammed bin Salman told British Foreign Secretary Boris Johnson that Iran's actions "may be considered an act of war against the kingdom." "I believe... [this] could be the start of more upheaval in the Gulf," said Meshal Al Faras, regional head at Janus Capital. "The normal reaction is to reduce risk" by selling shares, he added. Saudi Arabia's anti-corruption committee is headed by the crown prince. It has the authority to investigate, arrest, issue travel bans and freeze the assets of those it finds corrupt. Prince Mohammed is also leading the country's economic overhaul to reduce its dependency on oil. Fitch rating agency on Thursday said the recent arrests could concentrate power in the hands of the crown prince, bolstering his economic and social reforms, but also raises the risk of a backlash.